SHANGHAI (AP) — Mercedes has gone 1-2, 1-2, 1-2 in the first three races of the new Formula One season, a great start for the sport’s dominating team. 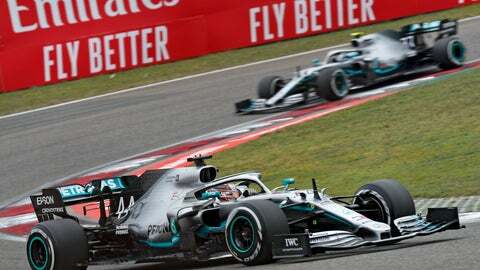 Lewis Hamilton and teammate Valtteri Bottas completed their third straight double in Sunday’s Chinese Grand Prix. That kind of start has not happened since 1992 when Nigel Mansell and Riccardo Patrese went 1-2 in the first three races. “As a team, we didn’t expect to have three 1-2s,” Hamilton said. He acknowledged there’s been some luck involved, particularly two weeks ago in Bahrain when Ferrari’s Charles Leclerc should have won, but was undone by late engine trouble. “I think we’re over-delivering a little bit at the moment,” Hamilton said. Sunday’s race turned out to be over in the first 30 seconds. Second on the grid, Hamilton beat pole-sitter Bottas to the first turn and then led for the entire 56 laps. It was Hamilton’s sixth victory on the Shanghai circuit. It was also the five-time and defending champion’s 75th career victory, which moved him into the lead in the overall standings after three races. The next is in two weeks in Baku, Azerbaijan. Sebastian Vettel of Ferrari was third ahead of Red Bull’s Max Verstappen and Leclerc. The Mercedes 1-2 streak — two wins for Hamilton and one for Bottas — comes despite early hints that Ferrari had more flat-out speed. Bottas acknowledged he was done in by his slow start, with Hamilton racing ahead out of the first turn. The 21-year-old Leclerc of Monaco was upset after about 10 laps when his Ferrari team ordered him to let Vettel pass. Vettel was in fourth at the time and Leclerc was third. “Let Sebastian by. Let Sebastian by,” the team radio told Leclerc. He replied, clearly irritated: “But I’m pulling away” as he backed off and watched Vettel pass. Ferrari team head Mattia Binotto told reporters earlier in the week that preference would be given to the four-time champion Vettel over Leclerc. At least early in the season. “If there is any 50-50 situation where we need to take a decision, the advantage would have been given to Sebastian, simply because Sebastian has got most of the experience,” Binotto said. Despite benefiting from team orders, Vettel was not thrilled with his finishing position. He was asked about the team orders and didn’t give a straight answer in the post-race press conference sitting alongside Bottas and Hamilton. “I’m not sure I want to answer,” he said, chiding some reporters for taking his words out of context. Vettel expressed some frustration. He said the car was “strong, nothing wrong with it.” But he said the team had to find a way to “unlock” the car’s performance. “At this point it’s a question of putting it together,” he said. Hamilton has 68 points after three races followed by Bottas (62), Verstappen (39), Vettel (37) and Leclerc (36). The race was billed as the 1,000th in Formula One history dating from the first race in 1950 at the Silverstone circuit in England. That was won on May 13 by Guiseppe Farina in an Alfa Romeo.